Last week I attended the New York City Entrepreneurs Roundtable Accelerator’s demo day, where the accelerator’s latest cohort of startups presented themselves to a large audience of investors and venture capitalists. The majority of startups on the demo day focused on topics that have nothing to do with sustainability issues, from creating better marketing tools, automating processes and creating online marketplaces to improving shopping experiences (here and here). Overall, they want to make things better for companies and/or consumers, but not necessarily more sustainable. This is no accident, I thought to myself. Startups just don’t seem to be interested in opportunities related to sustainability issues. 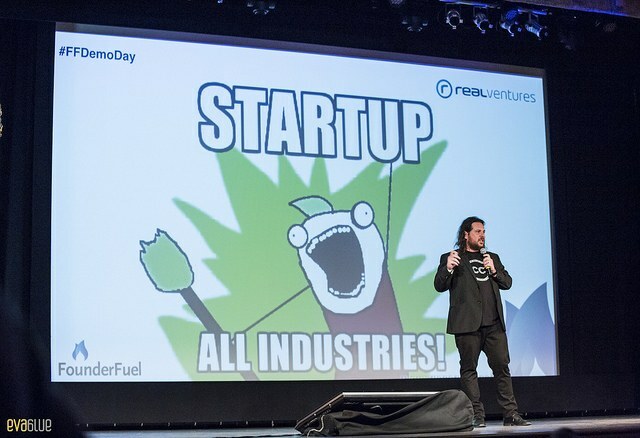 But wait a second: Could this demo day be the exception, not the rule? Is the startup community all about suitability and I just don’t see it? I found out that, of the 255 startups, only 19 (7 percent) were developing sustainable technologies and services. Healthcare (here and here) and peer-to-peer marketplaces (here and here) seem to be the most popular categories. Why do so few startups go after sustainability challenges? I find this question extremely important. After all, innovation is key in addressing the sustainability challenges we face, from climate change to inequality. When thinking about it, I remembered a guest lecture Paul Graham, co-founder of YC, gave a in a startup class at Stanford University. In his talk Graham referred to the question of where good startup ideas come from. So, if we look at the criteria Graham established, we could narrow the possible answers to the why question into two: Entrepreneurs either don’t think that sustainability issues matter and hence don’t learn them, or they don’t find them interesting. I tend toward the latter. I believe that most entrepreneurs understand that sustainability issues are the ones that really matter and would agree with President Obama describing climate change as the challenge posing the greatest threat to future generations and rising income inequality as the "defining challenge of our time." Well, at least I hope this is the case. However, I think entrepreneurs just don’t find sustainability problems interesting enough to work on. It’s not that they think these issues aren't important or lack business viability – they just don’t find them interesting problems to work on as entrepreneurs. This is partly a framing problem and partly a cultural problem. The framing problem is more general: Sustainability seems to be perceived as an issue that is addressed by governments in global conferences, regulators and large companies through their CSR initiatives. Just think of California’s drought, food waste, ethical working conditions in the supply chain, and clean energy – is entrepreneurship the first association that comes into mind when thinking about solving these issues? I doubt if this is the case with the exception of clean energy. The sharing economy is also an exception (i.e., solution is associated with entrepreneurship), but we have to acknowledge that there are almost no comprehensive studies of its impact. You might ask yourself if this is the case why I classified p2p marketplaces as YC sustainable startups. The answer is that I give these startups the benefit of doubt that their activity reduces the need to produce new stuff (by, for example, providing opportunities to sell used furniture). But I wouldn’t necessary categorize any sharing economy company as a sustainable startup. Is there a more obvious issue than sustainability when thinking about living in the future? Well, apparently not according to Graham. Yet, this is not just Graham. Think of all the people entrepreneurs see as heroes and want to imitate. To what degree is sustainability part of their narrative and work? Until the culture of this space changes, together with the perception of sustainability, I doubt if we’ll see any change in the focus of new startups when it comes to sustainability. Of course there will always be exceptions. But if we want to change the status quo, we need the majority of startups to focus on sustainability issues. Otherwise, “living in the future” might not be that pleasant, not even in Silicon Valley.